This week, Brenda of Pumpkin Patch Primitives held a contest for those of us in her yahoo group. We had to name the pattern she was working on and the winner got a copy of the pattern. Well, I went through every page on her shop and found it, lol. I couldn't believe I was the first to answer, considering my server was being slow that night. Today I got my package and I can't believe how quick it came. 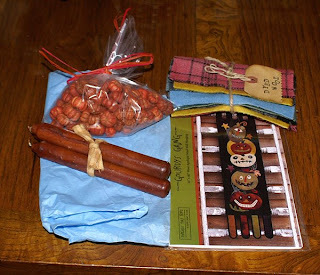 I was expecting a pattern, but Brenda sent along a package of goodies and all items I love and needed. I have bowl fillers and with the new items, not enough filler, so now I have more pumpkins to add to my mix. I also need prim candles and cannot find good ones around here and she sent me three. 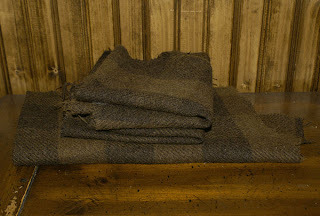 Plus, a beautiful bundle of hand dyed wools. All that along with the pattern. I love the pattern and it will be so fun to make. I feel like I won the lottery;) Be sure to check out Brenda's shop. She has great prim patterns from all the best designers, wonderful fabrics and great deals. 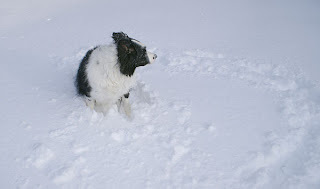 Now for those who may have misunderstood my title and thought I had a prize, keep your eyes out on my blog. I am nearing the 100th post and will be doing a contest soon. Today I did my Library run and hit a few local antique stores. We lost our prim store, but a new antique store took it's place and I found lots of wonderful things today. Of course I didn't take them all home, I just admired them and wondered where I might put them, lol. But, I did find one fun item that I had to have and will use it to make a theme area. I found this basket of thread bobbins from a local mill. It came with a paper that explains about them and the mill they came from. 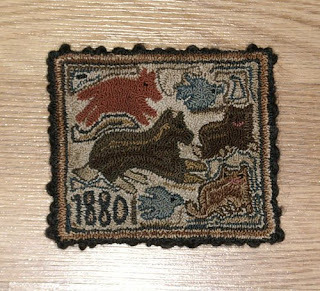 I thought it was a great piece of Rhode Island history and a textile theme would be fun. I do have to do something about that ugly topper I put on my table. I guess I need to make an extreme prim penny for that table now. I have my drying rack with doilies and items above it and the quilt ladder next to them. I did see an antique rug beater and maybe I will pick one up next time, would go nicely on the wall. Here is a close up of Dora, she is just too cute. But, don't let that sweet face fool you, lol. Izzy really wants to fit in with the family. She was supposed to stay until my son found a new home for her. But, as you can see, she just loves it here and loves her sister Dora. Today I worked on my rug and was hoping to finish the last dog, but that isn't going to happen, unless I stay up another hour working on it;) So, I decided to show you some pieces I made this month. I have not decided what to do with them, they may be presents, they may go on ebay. I have not had good luck with ebay and hate to put things up to see them go for pennies, I rather give them as gifts. This piece is based on an antique rug. I love the simple designs and this is what I based my runner on. Love the simplicity of it. I think it would look good on an antique box. This piece was based on an old postcard. I thought it would make a nice needle keep or on a sewing box. I used 3 strands for some of the smaller areas and the rest was 6 strands. I belong to a group called An American Primitive Gathering. You can find our listings under USAPrim on ebay. This weekend we had an online retreat and we worked on projects for next Christmas. It always seems like there is not enough time to make things for everyone, so this is a way to have things that we can give as gifts or sell on ebay. 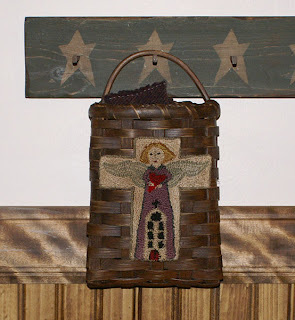 I decided to make a piece from one of Primitive Betty'spatterns that she offers for free on her blog. It was a fun little piece and I kept it simple and prim. 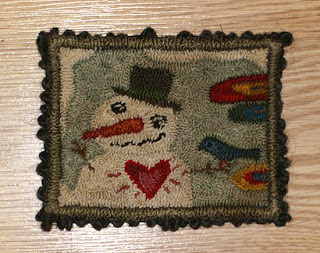 I think it is a great piece, because it can be used for Christmas or during the winter season. Today was a run around day, needed supplies, trip to library and groceries for the week, so got that all done. My husband is only home one day now, so we run around, he cooks dinner to give me a break and then back to maine, not very fun. Tonight I worked on a new punch. A group I am in, is doing an online craft in, this weekend. We will be doing it once a month to make items for next Christmas. We are always saying we don't have enough time and the holidays come so fast. This way we get a head start and have nice items to give as gifts next year. 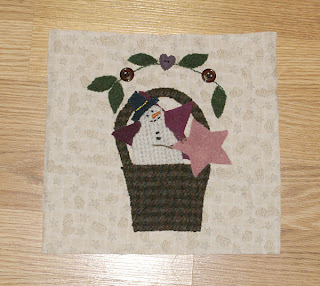 For my project, I am working on a punch needle piece, using Primitive Betty's snowman, that she offered as a freebie. 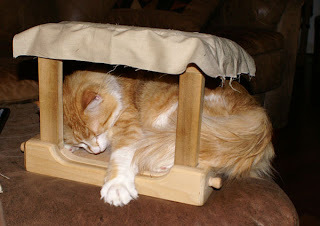 Dora has decided that she likes my punch frame, so even if I am not using it and there is no piece on top, it still makes a great sleeping spot. 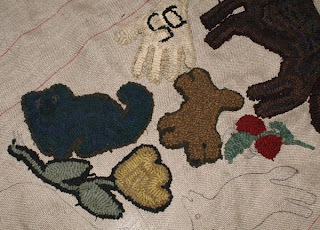 I worked more on my rug and finished a new punch, but I can't show it, since it is a future present. Tonight I finished the applique on a wall hanging I am making. I wanted to make something fun and simple that I could do in my lap and decided to use a design from Primitive Blessings. 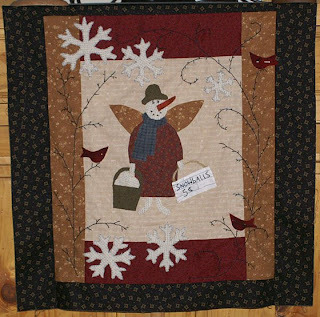 I just love her designs and this snow lady was perfect for a winter wall hanging. I added a different sign and the bucket of snowballs, plus the hat. I might put a flower on it tomorrow. 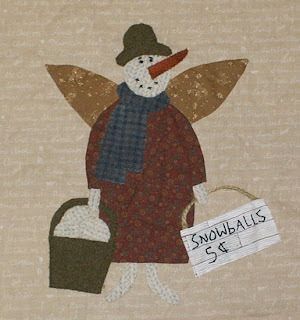 I will add a border and then do some stitchery which may include snowflakes. If you want some fun designs, check out her site, she has free ones and epatterns that are inexpensive. I have my eye on a few that will make great presents for my friends. 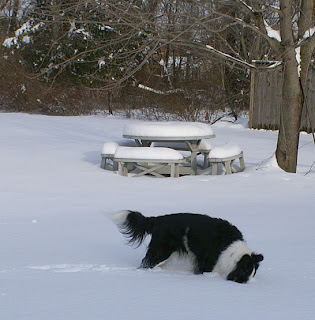 Yesterday, when it stopped snowing, I went out and shoveled. 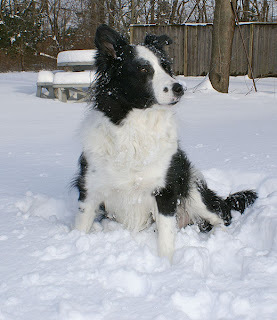 Then it started again and I went out and shoveled the new snow. I heard it might rain, so didn't want any snow if that happened. I do not need an icy mess. I woke up this morning and it was snowing again, ugh. So, when it stopped, I went out shoveling. I do the back stair ways and I make a path and area for the dog to do his business. Today I thought I was going to pass out, but it had to be done. Luckily when I got to the end of the driveway where the wet heavy snow, that the snow plows throw back at me, my son came over. It wasn't much left for him, but it was the worst, so it was nice to have him do that part. 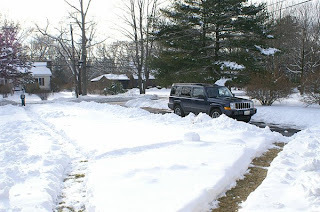 So, I took a pict of the driveway and mail path, and sent it to my husband. He bought a really nice, really big snow blower, but I have no idea how to use it, guess I need to learn when he gets home this weekend. I am not supposed to shovel, I have scoliosis, arthritis, rheum and displaced ribs, but I did it anyways. Now I am feeling it, but I made up a fun little quilt piece, so I can sit and relax the rest of the night and work on that. The kitties were stuck inside, I do not let them out. I doubt they would bother once they got their claws into that cold wet snow. 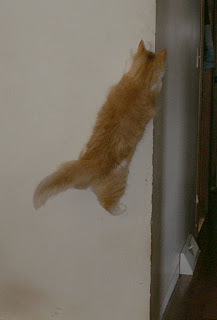 As you can see, being stuck in a house, is driving Dora up the walls, literally! I need more blacks for the background of my rug, so I decided to do some dying the other day. I used various shades and then overdyed them with hook book black. Well, the recipe called for dark brown, which I don't have so I used seal brown. 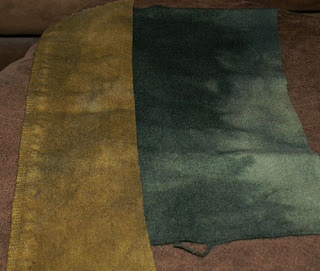 It also called for olive green from cushions and I had an olive green from CK so I used my substitutes. I am not sure if it was the wool or the changes, but most of the wools came out darker, but not black. But, it is a nice recipe so I thought I would share it with everyone. I do not measure exactly and I do not put a set amount of wool in the pot, I just throw a bit of this and that in, lol. So, these are estimates and you can try your own experiment. I used about a half yard of wool. I used 1/4 teaspoon of black, 1/2 tsp of seal brown and 1/2 of olive green. Make sure you heat your water and stir the powders till they are completely dissolved. I add my pre-soaked wool and let it sit in the pot, until the water is almost clear. Then I add about a cup of vinegar. I used procion (C&K Craft) for the black and the olive green and cushing's seal brown. This recipe can turn light grays into brown, that is what was so great about this experiment. The wool I used here, was white and gray when it started. Now it is a wonderful mix of light to dark browns. This would be great for trees, animals or backgrounds. So, if you do not have an olive green, try another shade of green or substitute the brown and make up your own new color. I decided to try the Bunny Hill BOM. She is offering a free BOM each month and then the instructions for the borders and finishing. I thought it would be fun to try one and it is a great design. But, as you can see, I mutilated it, lol. It is crooked and my colors a bit dark and I forgot the last leaf, duh. 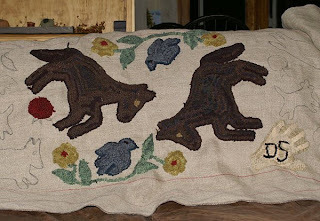 If you would like to try the BOM, you can go to the Bunny Hill Blog and download the pattern. She has also set up a flicker site for those participating. It is fun to see all of the blocks being made. 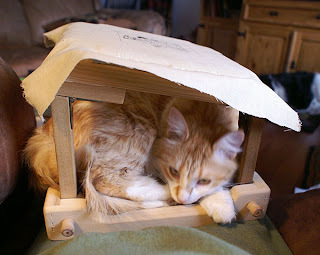 Today Dora decided to hide out in the wool downstairs, so I took the opportunity to work on a new project. It will be a present, so of course I cannot show it yet. Tonight she is being nice and letting me finish the background. She wanted to hide in the cabinet under the tv and yes she opens it herself, way too smart. But, Izzy thought it looked fun and followed her in and the next thing you know, my supplies come tumbling out along with Dora. So much for Dora getting some peace. This is a cross I made up for a friend who loves crosses. I wanted to make it into a stuffed piece, but couldn't figure out how to make gussets or sides to make it stand up. I was in a time crunch, so I mounted it onto a basket. I would like to do more designs like this. This one I just doodled up, so it will be fun to come up with some new ideas with the cross and improve on the layout. 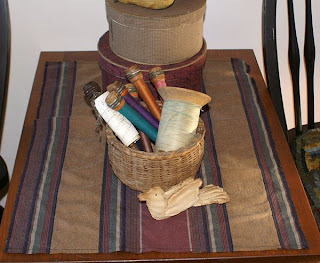 The basket I found in a thrift and painted a mustard color, then antique over that. I finish with a matte spray. Today I decided to work on a new punch, another present for a friend. 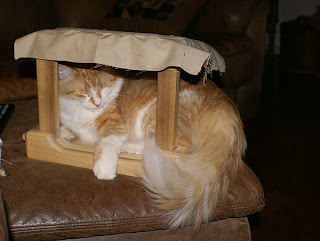 It seems that whenever I put the frame on my lap, it is a sign for Dora. Now this is a punch needle frame, small and Dora is not small, but it doesn't matter, if she can squeeze into it, she will. 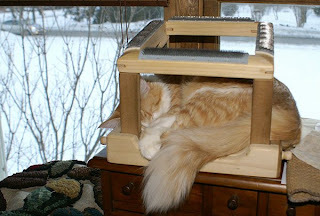 I have had cats who love to do this with my rug frames, but I can hook with kitties, but I cannot punch with them. She is also persistent about staying and I literally have to tip it over to get her out and even then, she resists. Dora with her looks, she is very vocal with her eyes. This is the, try and get me out look. She is on my lap, so it was hard to get a shot so close. This is after I dumped her and the frame on the couch, sideways, she is still insistent on staying put. I finally decided to put the tunnel in the room and she and Izzy had fun with that for awhile, before she got bored and came back to harass me again. I got to work some more on my rug today. I decided to have fun with the cat and used some thrift wools that I had in green and blue. They were both dyed in a darker shade to get a bit of variation to them, so it gives them a more darker appearance. Hard to tell in the pictures, the camera loves to grab colors. I also decided that the apples didn't work, so I made a little cherry branch instead. As usual, I throw in faces with what worms, I have on hand, so those get redone later. I am using black shades around light object, dark olive green around the brown and on the kitty, I use a black/gray texture that I had. I will use those and some dark browns as the main background colors and try to keep them close to the black hue, so that is blends in and adds movement. For the tulip, I used a gold as is jacket that had touches of brown and varying shades in it. I mixed a yellow/gold that I dyed myself. The reds are from red jackets. I over dye them with maroon or mahogany to get the varying shades. I thought this picture would give you an idea of the size of the rug. The horses are about the same sizes as the kitties, lol. Dora is the heavier of the two, Izzy has more fur than mass. Izzy is finally coming upstairs more often and likes to be nearby when I am working. Of course Dora always has her eyes on what she is doing, she is way too jealous of my attention. 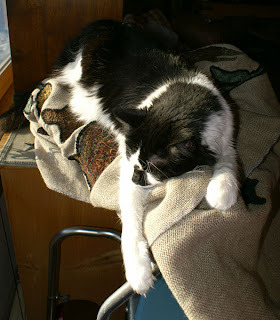 Today I gave my rug hooking a rest and worked on finishing a basket for one punch and finishing another punch. One is a gift, so I will have to wait to show you and the other I should be able to finish tomorrow. Today we found a new site called Goodsearch. You can do your searches from their site and in the process, help a charity of your choice. Of course Dora and I picked our local pound, which is funded by Friends of the animals. Without them, our pound would be closed and the animals taken to another shelter which I do not care for. They are working on building a new area for the cats and dogs to play and more room for the animals. 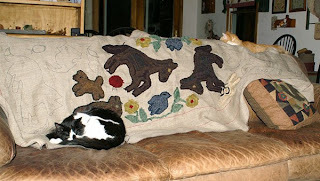 This year we donated when we found Dora and I gave them one of my kitty rugs for a raffle they will be having. 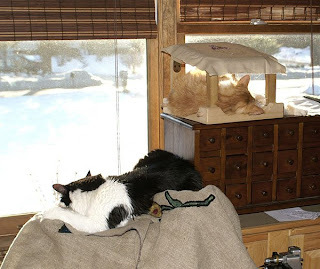 I have always gotten my kitties from them and there is no greater love than from a cat who finds a new home. So, check out Goodsearch and pick a charity from your local town, that you can help. We all browse on a daily basis, so why not help others in the process. Tonight while I was finishing up my punched piece, Dora decided to show me that she can fit in my small punch frame. 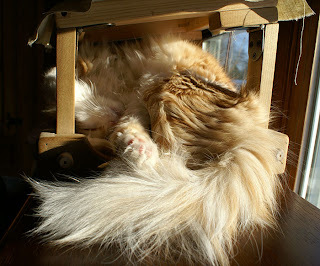 It takes a bit of squeezing and wiggling, but she gets herself in there. 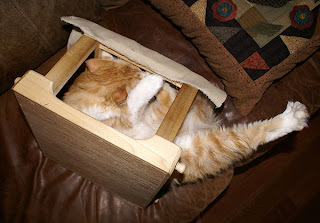 This is her, "I told you I could fit", look. 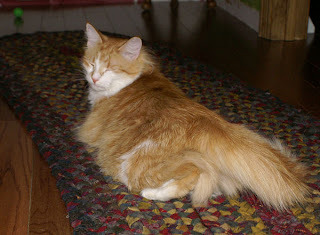 Of course she had to show off her beautiful tail by swooshing it around. Dora loves to use her big paws. She is a grabber and can leap incredible bounds with those feet. I used some plaids that I had lying around and I like how they worked up. I love experimenting with colors, and plaids give such unique effects. 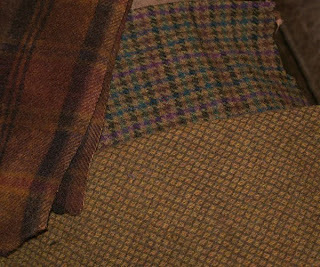 For the fox I used the multi-colored plaid and the one with a bit of what orange shade in it. 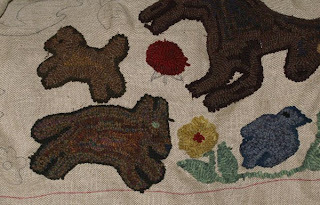 For the squirrel, I used the light/dark brown check. 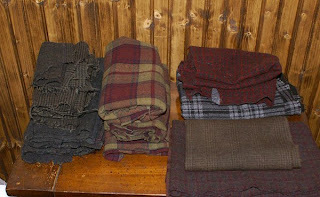 The multi wool was from a man's jacket, the other two were gifts from friends. The colors look brighter hooked, than they actually are. I take breaks and work on other projects and tonight, I did some sewing on my newest wall hanging and then a bit of punch needle. 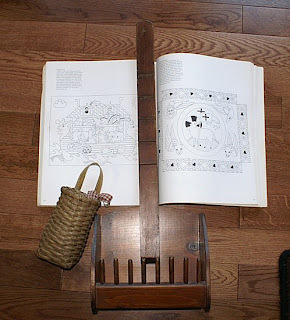 I got a wonderful book from my friend Kelley (Kanknchester) and it has two patterns in it I will be making. 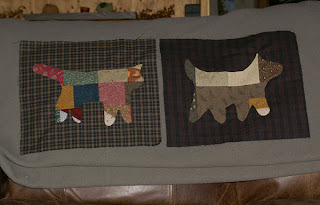 One is a crazy quilted horse hanging, but I decided I wanted dogs and cats, so I changed the designs. I pieced different scraps together and then using a template made from freezer paper, I cut out the shapes from the quilted blocks I made up. I grabbed colors from a bag, so there is no color scheme, just scraps. When I finish the blocks, there will be scrap blocks around the main blocks and then another border around that. It just seemed like a fun project to do. I have finished four so far and two more to go. 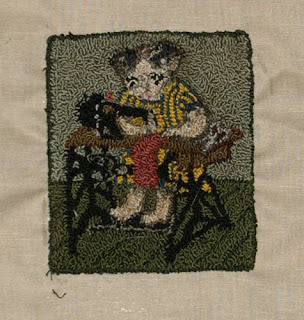 I haven't decided on faces yet or whether I will do machine or hand stitching, maybe both. Izzy is the newest addition to our family. She is my son's cat and I am supposed to keep her until he finds a home for her. I do not see that happening and at this point, she is adapting to our other furry members. 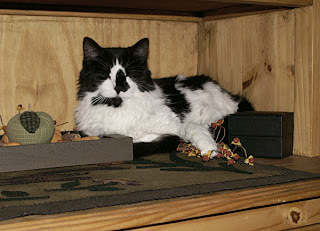 We know I will not have the heart to get rid of her;) Dora has already staked her claim on resting spots, so Izzy has found some of her own. Izzy also likes to sit on the ottoman next to me and watch while I hook. She loves the wool and loves to roll on the rugs. Dora is not too pleased, she gives Izzy the eye when she sits near me. Now Dora is becoming more obnoxious at getting my attention. Her newest thing is squishing herself into my small punching frame, while I am trying to punch, lol. I Think I will stick with a dark background, which means thinking of what colors I am using in the motifs to blend in with blacks and a bit of brown and greens. I have a few rugs with black backgrounds and since this rug will go behind the couch as a hallway runner, I want it to blend in with the rest of the decor. I think a light shade would compete too much. I will go with shades that blend with the blacks, but also show enough to give the rug movement. I also need to use lighter shades around the horses, so I may go with a brown shade or a gray black to set off the purples. It will be a matter of testing colors against them, to see what works best. I am not a fanatic about color choices, I pick some shades and then decide what works and throw it in. If you want to make your wool like this, you need to ball it up and do not stir, let the dye set by itself. I am not big on New Years. I stay home and we eat whatever and watch tv, no big deal. I had enough of partying in my younger days;) My New Years resolution to myself is to relax and stay away from stress, not always easy. I plan on working more on my house, making new and creative pieces and I will be working on more patterns this year. 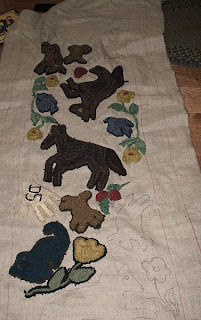 I am working on the large rug, some punched pieces, some quilting and where ever the spirit moves me. That is my new philosophy this year. I make what I want, when I want and spend more time on being creative. I will still sell pieces on occasion, but I will be concentrating on the creative process more than the sales. I decided that our first ladder was too big for the space, so my husband made me a new one. This one is narrower and has more rungs, much more practical and it gives me more space for other items. Now I have to work on the wall around it. I have a wall hanging to finish and maybe some new wood pieces will be added to the wall. We did get some books from the library, I have lots of things I want my husband to make, so maybe some box candle holders and a new shelf, quilt hanger combo. Here is the first ladder. 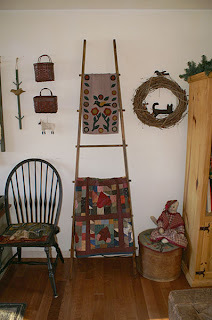 I will use it in my sewing room, perfect for hanging my unfinished quilts on. This is the new improved version. It fits the space nicer and I like the skinnier version.